When Labor Day rolls around and you plan to have a few people over, an easy recipe or two is always helpful. 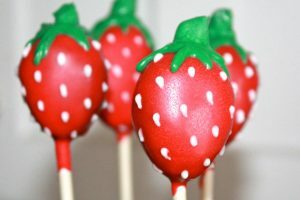 One Labor Day recipe that is sure to deliver in both taste and presentation are dark chocolate strawberry cake pops. This recipe will literally take the labor out of making an impressive Labor Day dessert. All this easy recipe requires is a little bake time, a cake pop pan, quality dark chocolate and some time. The final result is a Labor Day recipe that is an amplified version of chocolate covered strawberries. All you have to do is grab a pop and eat. 2. Sift flour into a bowl along with the baking powder and salt. 3. Combine the sugar, butter, eggs and vanilla extract. Beat for 2-3 minutes. 4. Add the dry ingredients along with the crushed strawberries. 5. Beat for an additional 2-3 minutes and the batter is done. 6. Pour batter into the cake pop pan. 7. Bake for about 25 minutes or until the cake pops are golden and a tester comes out clean when inserted in the center. 8. Remove from the pan and cool. Repeat with remaining batter. 9. Refrigerate cake pops for 1 hour and insert sticks. 10. Line a baking sheet with parchment. 11. Combine dark chocolate and butter in a double broiler with simmering water. 12. Stir until chocolate melts. 13. Dip each pop in the dark chocolate glaze. 14. Place onto parchment so the chocolate can harden or insert sticks into a Styrofoam block. This Labor Day recipe is amazing! The exterior has that signature deep dark chocolate flavor and the cake is moist and fruity. Although this super easy recipe will satisfy any sweet tooth, it is not overly sweet. Using dark chocolate instead of milk chocolate gives this dessert balance. Not to mention dark chocolate is packed with antioxidants. This Labor Day recipe has fruit, chocolate that is good for you and it’s on a stick! What can get better?